Seaside getaway, steps to a private bayside beach! Welcome to the private beach just 50 yards away! Beautiful vaulted living room open to updated kitchen! 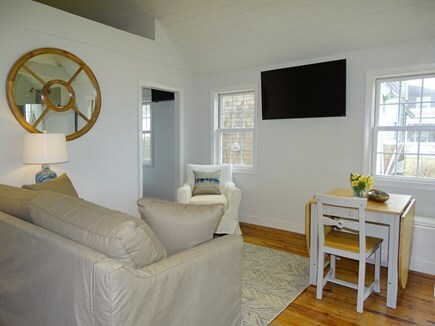 The ''Plovers Nest'' is within yards of the best private beach on Cape Cod,adjacent to Mayflower and Chapin Beaches. The tidal flats make the beach kid friendly while the gorgeous expanses of sand are perfect for spreading out and relaxing on. 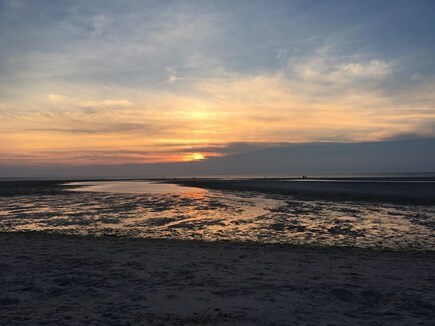 Enjoy a breathtaking sunset over the Cape Cod Bay to complete your day at the beach. 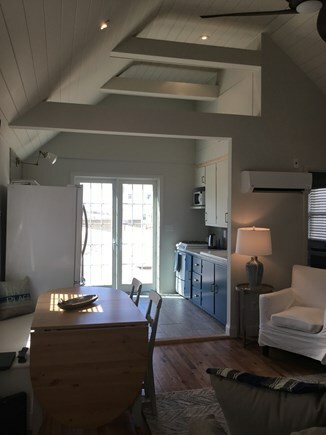 The ''Plovers Nest'' has been completely renovated for the upcoming 2018 summer season with vaulted ceilings, a new bathroom, and an updated kitchen with new appliances, including a washer & dryer. The kitchen maintains its charm with antique cupboards and original cast iron drain board sink. French doors lead to an ocean facing deck. A second deck is available for additional dining and lounging. 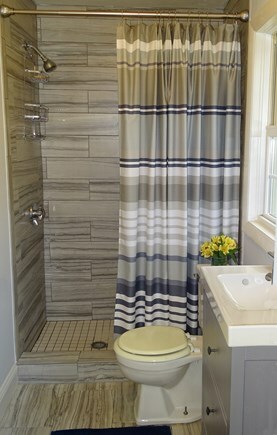 An outdoor shower and private grassy backyard with gas fire pit and gas BBQ grille completes this outdoor escape. The open living room has vaulted ceiling, A/C, a ceiling fan, comfy seating and a corner dining nook. The living room also has a HD Cable TV, Wi-Fi, and DVD for entertainment. Master bedroom has a queen bed and a wall mounted cable TV. The second bedroom has two sets of bunk beds. 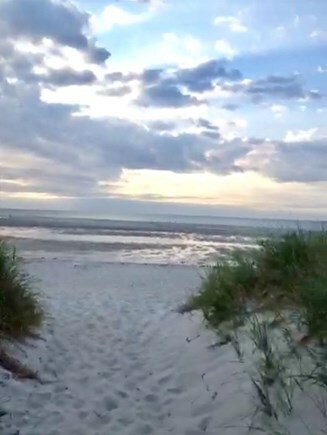 If you ever decide to venture away from the ''Plovers Nest,'' you are a minute's walk to Chapin's restaurant with an outdoor oyster bar and live music and Gina's by the Sea with amazing Italian food. A short drive will bring you to Dennis Village, Cape Cod Playhouse,markets, additional dining. Our family favorites Smugglers ice cream and Captain Frostys seafood casual dining. Additional availability info: Off season begins 9/2/17-6/22/18 and begins again 9/1/18-6/21/19. With a 3 night minimum. This is a Saturday to Saturday vacation rental. I stayed at the Plovers Nest in August, 2018. It was fabulous! 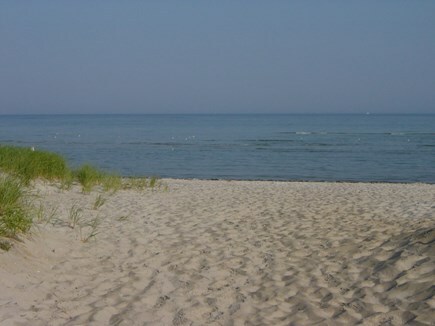 The main reason we vacation in East Dennis is to go to spectacular, private beach between the famous Mayflower and Chapin beaches. The beach has all the majesty and beauty of Mayflower Beach, but without the crowds. 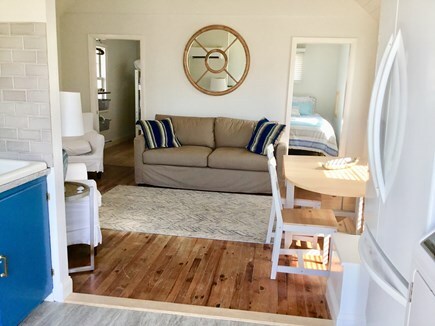 The Plovers Nest is a VERY short walk to the beach and you can see the beautiful white dunes surrounding it from the spacious front patio. 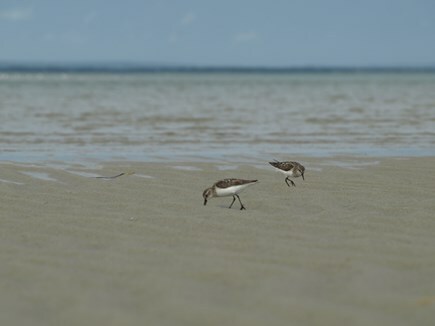 Spent a great week at the Plovers Nest. Its location is a very short walk to the lovely beach which is perfect spot to view the beautiful sunsets. 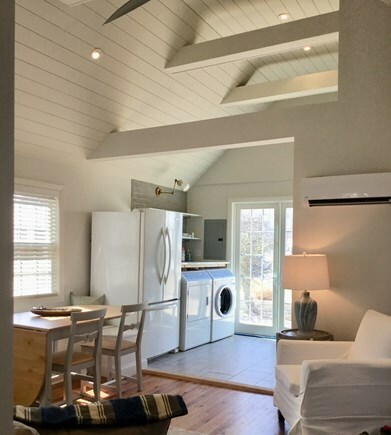 The adorable house has all the amenities needed including a washer and dryer and a gas fire pit. There are multiple outside spaces such as the front deck with chairs and fire pit, side deck with rocking chairs, and table and chairs in the back yard for dining. Would definitely stay here again!